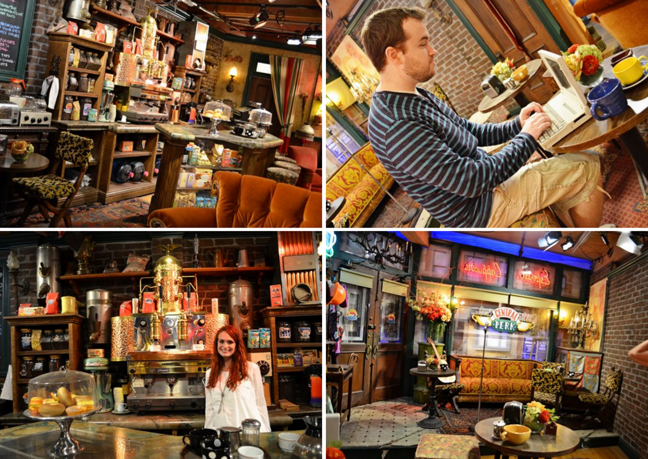 When I saw that Sarah sat on the FRIENDS couch at the WB VIP Studio Tour here in Burbank I was like I HAVE TO DO THAT! FRIENDS is our all-time favorite show. I mean, my blog post titles are mimicked after their episodes and we have a cat named Rachel, a dog named Joey, we used to have a bunny named Chandler, we used to have finches named Alice and Frank Jr., and if we ever get a poodle we'll name him Ross if it's a boy or Monica if it's a girl. Moral of the story: WE LOVE FRIENDS. We booked our tickets earlier this week, hired our friendly neighborhood babysitter for this afternoon, and then headed out. 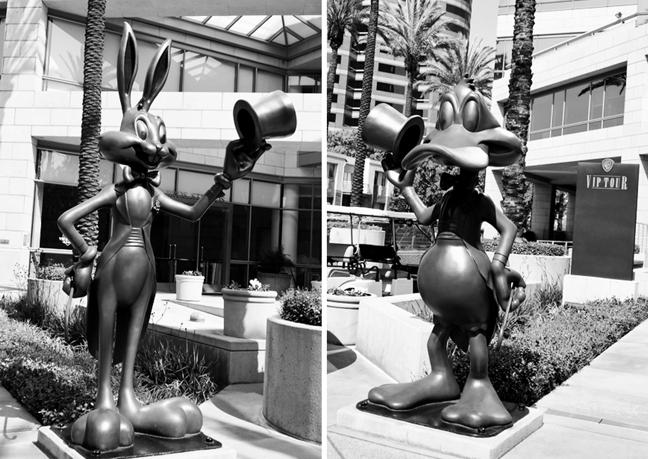 Bugs Bunny and Daffy Duck were there to greet us. Even the waiting area was filled with movie props and costumes. I was most interested in the Harry Potter stuff. 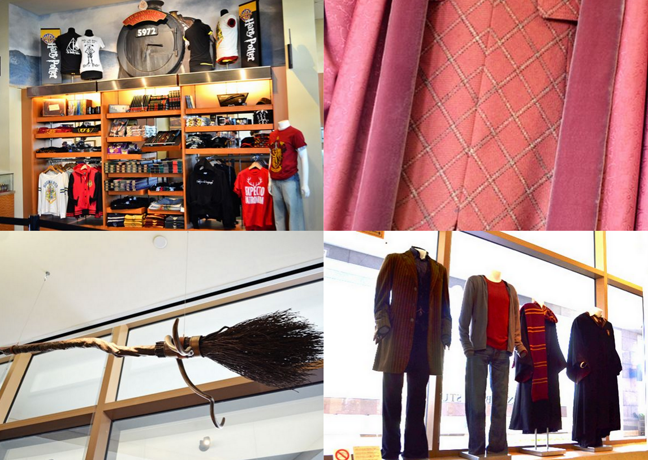 Clockwise: Harry Potter merchandise / a close-up of Dolores Umbridge's costume / one of Harry Potter's quidditch brooms / costumes worn by Sirius, Ron, Hermione, and Harry. From one of the Defense Agains the Dark Arts teacher's office - I so want these for future Halloween parties. After a few minutes of browsing, our tour guide came out, seemingly less than pleased to be there... and we loaded up into a giant golf cart. Right away he started spouting off fact after fact after fact - I can't remember them all! These mountains are used in the backdrop of shows like M*A*S*H. Just on the other side of these mountains in Burbank is the Hollywood sign. A jungle - used in Jurassic Park, The Last Samurai, and lots of TV shows. This scary alleyway is where the famous upside down Spiderman kiss took place! 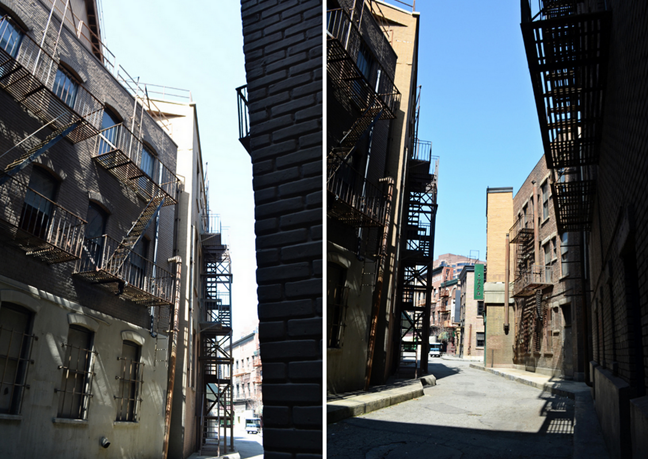 It's also used in The Dark Knight and any likely any other movie/show with a dark alleyway scene. Small Town USA! I swear they just cloned houses from South Pasadena. 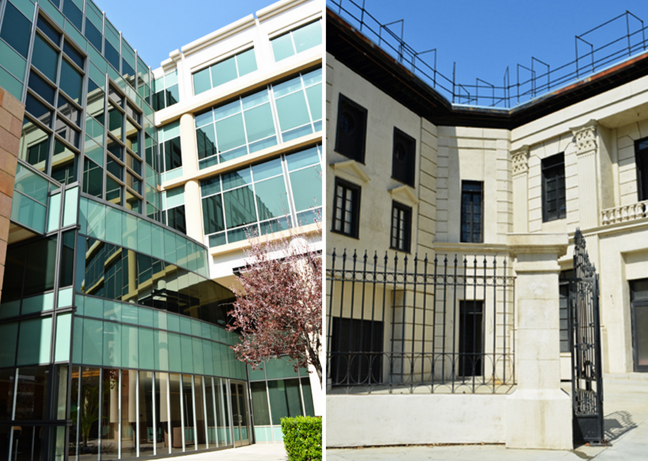 This WB building is the finance department but it's used in many TV shows as a hospital or police department / Roree's (from Gilmore Girls) Chilton school front gates. This is also used as an embassy in a bunch of shows like The West Wing - all they do is switch out the flag in front. We told our guide that we were mostly there for FRIENDS. When he said this patch of grass is where Phoebe ran through Central Park, Chris piped up and asked if we could stop and get out and take pictures! This patch of grass is where Ross played rugby! Stop the cart! RED ROSS! 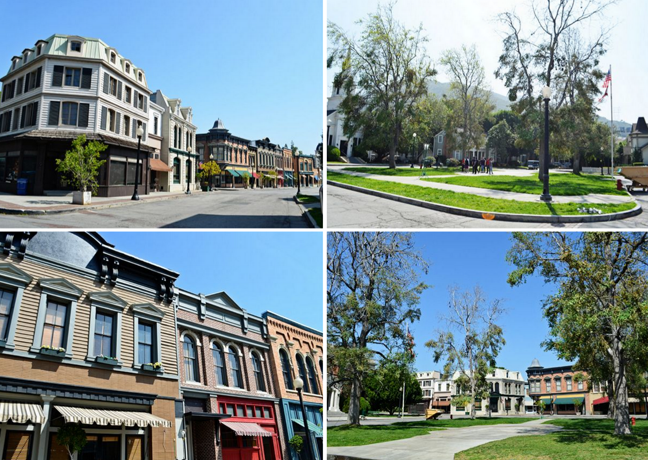 Everything about these buildings and exteriors is fake. This one building doubles as a school, library, and city hall. It's got three sides! 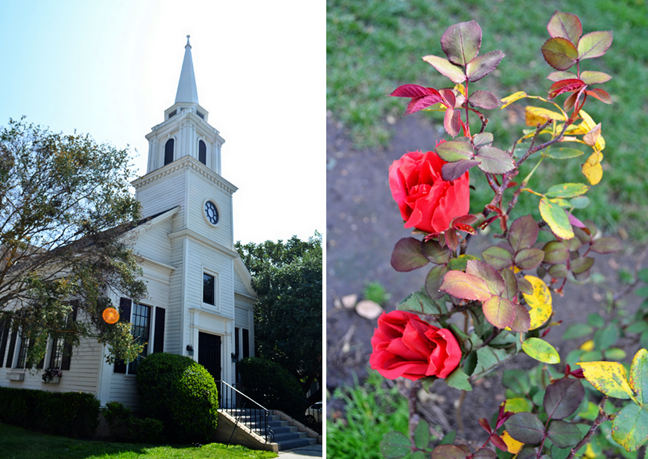 Welcome to Stars Hollow (now the town in Pretty Little Liars). The gazebo is missing from the center, but still, pretty cool! All of the branches on the trees can be removed and pinned in place. The plumbing is fake. The lights are just plugged in. These roses aren't even real! We could see them zip-tied onto the branches - which are actually real. Lorelai Gilmore's house. The back of Lorelai's house is Sookie's house. This house was used as Phoebe's father's house! Seeing all of these places makes me want to go back and watch those episodes. 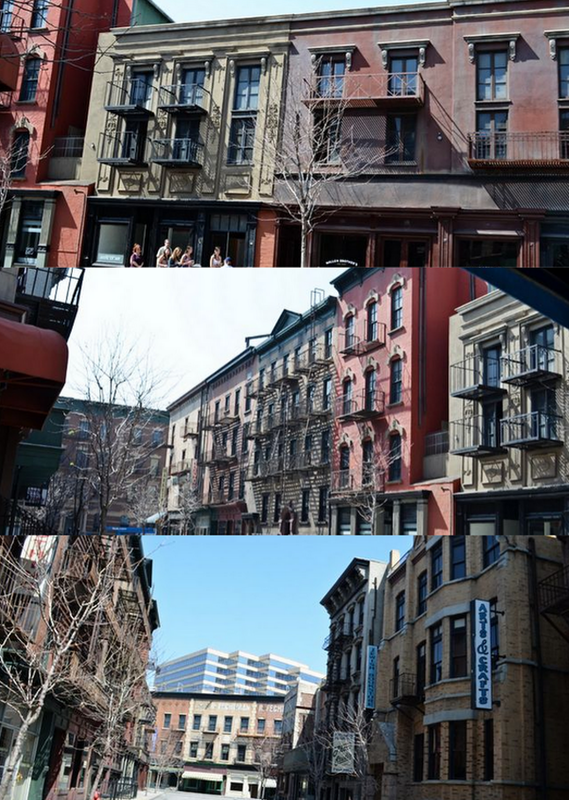 This is where any exterior shots of New York were filmed in FRIENDS! I was so starstruck. The stairs where fat Monica came down for her prom! The buildings, inside and out, are just bare bones. There aren't ceilings because lights are brought in to shine down. Apparently the lights get really hot, like 150 degrees hot, so massive air conditioner vents also come down through the ceiling to fan off the actors and keep them cool and their make-up intact. Everything from the light fixtures to the handles on the cupboards and cabinets has to be brought in and "dressed" for anything to be filmed. So much work! Our guide said this was a set up for an Arby's commercial or something, but Chris thinks he was lying and hinting that something cooler was being filmed there. Everything will have to be put back once they're through - even as far as re-cementing the road! All that for a commercial!?! At one point we had to put our cameras away to go through a sound stage. We saw where Two and a Half Men is filmed. It's a long building and the back is filled with seats for a live audience. 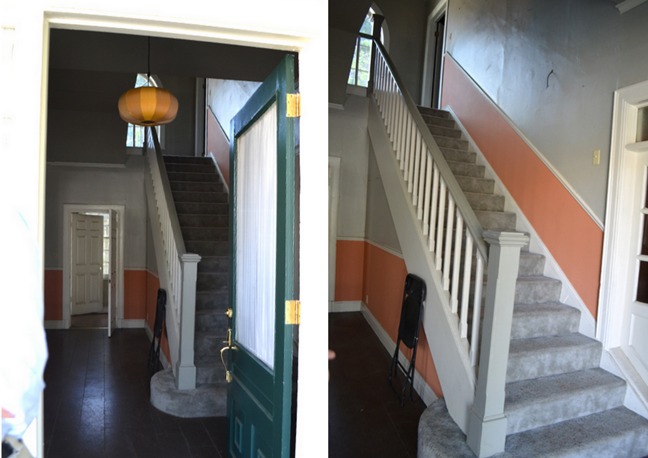 The front is all the set ups - the main rooms where most of the scenes are filmed. 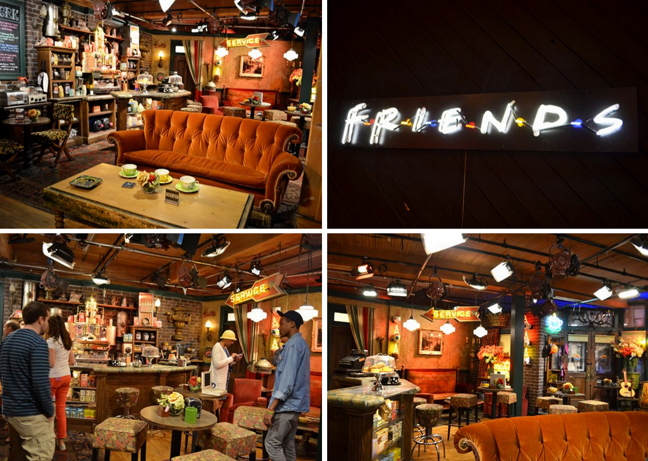 Oh how I would have loved to sit in on an episode of FRIENDS being filmed! Then we went into a building full of costumes and relics from movies. The entire second floor was dedicated to Harry Potter. Perhaps the coolest things we saw were the original cover jacket artwork for Harry Potter and the Chamber of Secrets and Harry Potter and the Prisoner of Azkaban. They were so detailed and amazing! We also got to try on one of the four original Sorting Hats. I was put into Slytherin, wah wah. Chris into Hufflepuff. There is a ginormous building full of props that can be rented out. 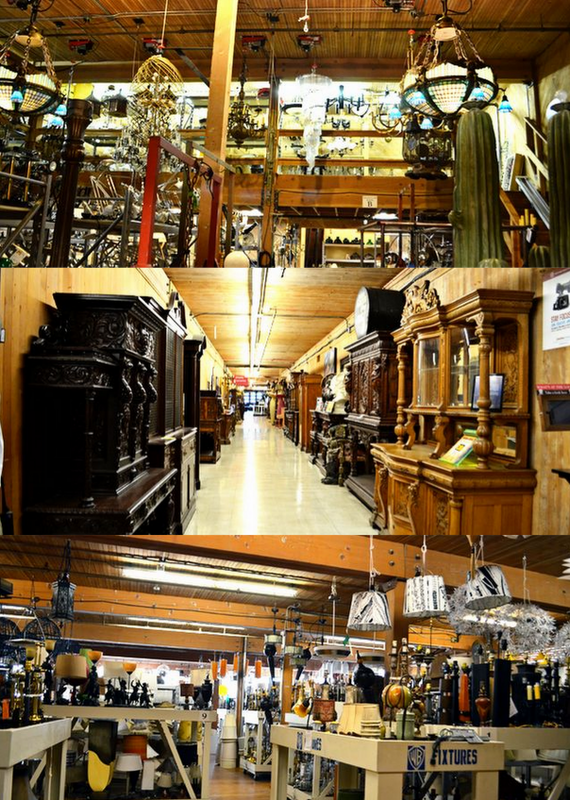 The price is based on 10% of the item's value as appraised by an auction house. We went into a warehouse full of famous cars. 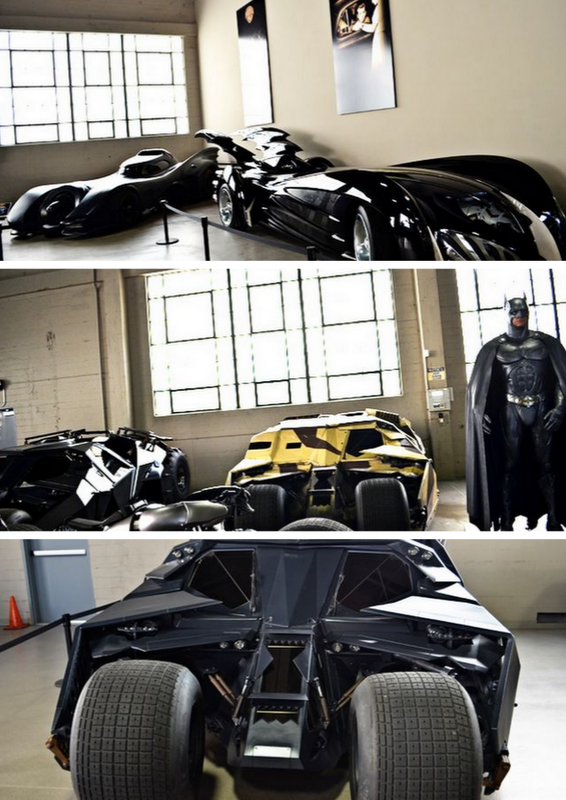 Lots of Batmobiles. The guide said these all actually drive, neato. The character wall! I've only seen this from outside the gates - it was fun to see the entire thing straight on. We toured through Ellen's stage. Been there - done that :) We saw her parking spot and offices. And last but certainly not least, the main reason we went on this tour - FRIENDS! 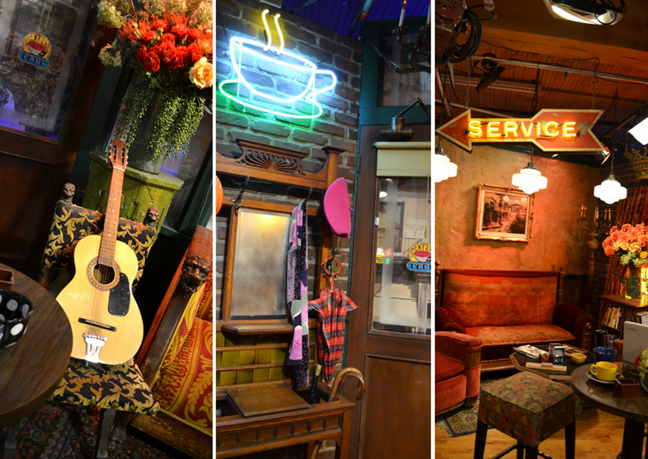 Before we walked into Central Perk our tour guide looked straight at me and said, "Don't freak out!" Haha. He knows me well. But really, I can control myself :) AHHHHHH! It's NUTS how big the room looks on TV, and even in these pictures, but really the square footage couldn't have been more than 600 feet! It was cramped and tiny and squished! It's such an illusion! The coffee bar / Chris typing on Chandler's old-school laptop / I'm Rachel! / Where Phoebe sang oh so many awesome songs. I asked to sit on the couch and the guide said we're not supposed to, but I argued and said that's why we were there(!!! ), so he kindly obliged and even took our picture. My life is now complete cuz I sat on the FRIENDS couch. How fun! Love Friends and still miss it! Ahhhh! I need to do this! I so would have gotten up to sing smelly cat. Love the Harry Potter stuff too - this is going to be a must do on our next trip out! This looks like something we would love. :) Our favorite was Universal Studios when we went a couple of Summers ago. you have an amazing life pegs! full of adventure and creativity. I have been reading your blog for years now and I am so fascinated with you and your fam.im soooo happy for you guys and your big news about Germany. cant wait too see the blogs on that! love ya!! LOLOLOLOL! 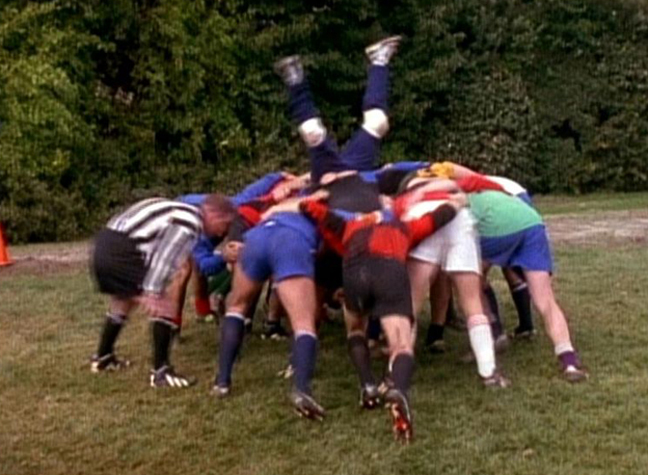 I love that you re-enacted the Phoebe run! We have watched and re-watched Friends episodes over and over again. Actually we got the whole thing from the library recently and started re-watching them from the very first episode forward. Looks like an all around awesome tour. WOWeeeeeeeeeeeeeeeeeeeeee! I feel like I just went through the tour virtually with you and I guess I kind of did. LOL I love the running through the park like Phoebe action! That's just too cool! I got to go on the same tour maybe 3 years ago when my work licensed Harry Potter. I'm a big Friends fan too! 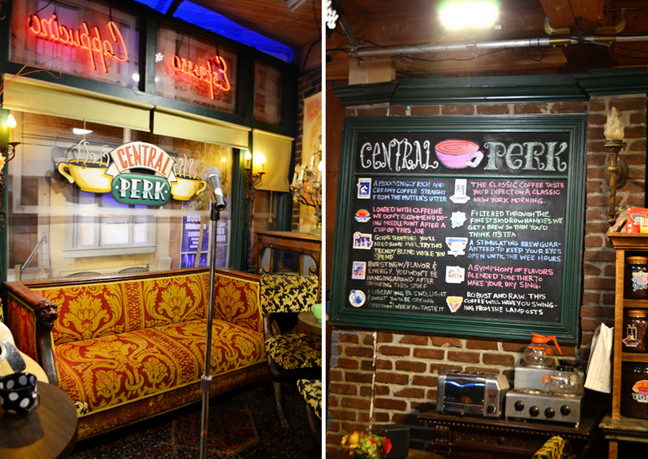 Loved seeing Central Perk and sitting on the stairs in the Fat Monica Prom episode. So fun! Glad you had a good time! oh my FUN!!! SO glad you are taking advantage of an AWESOME place with SO many cool things--FUN! Its like a trip down memory lane - all the best bits of friends! SO cool! I love that you are doing all of these amazing SoCal things before you leave.... so smart to take advantage. haha. and I often think of Pheobe when I'm out running. SO, SO, SO, SO, SO, SO JEALOUS.